Happy Fall, everyone! For the first time in my life, I'm actually glad that summer is over and the cooler weather is here! Was it just me or was this summer a hot one!? 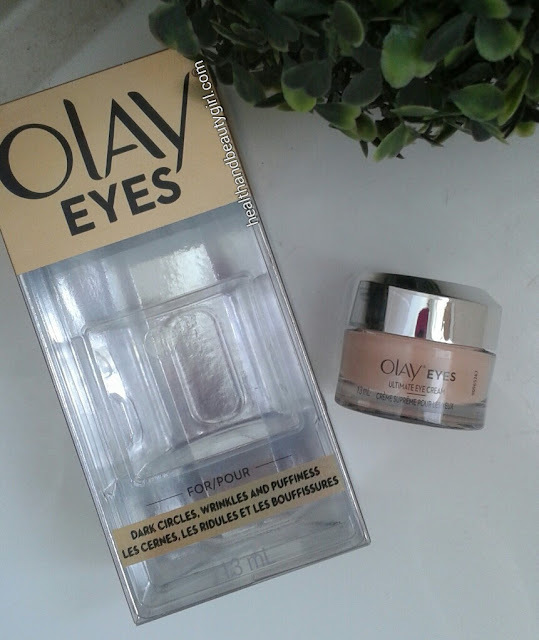 Today's post is all about the eyes and a product by Olay that I am testing out. I was very fortunate to get the opportunity to test out Olay's Ultimate Eye Cream through BzzAgent. This eye cream is supposed to tackle multiple eye issues, including dark circles, wrinkles, and puffiness. Since I have all 3 issues I was a good candidate for this product. "Ultimate Eye Cream fights wrinkles, puffy eyes and dark circles in an instant. Get the Eye Cream without paying 2x as much – for dark circles and wrinkles. 3-in-1 Decircler, DeWrinkler and DePuffer instantly reduces the appearance of fine lines and wrinkles. Contains Olay’s colour-correcting technology, which acts as a touch of concealer. The powerful formula, supercharged with peptides and vitamins. Formula quickly blends with all skin tones." 13 ml. "Supercharged with peptides and vitamins, it renews skin’s surface over time and reduces puffiness by massaging onto the skin. Formulated with Olay's colour-correcting technology, it acts as a touch of concealer that matches all skin tones." Water, Vinyl Dimethicone/ Methicone Silsesquioxane Crosspolymer, Glycerin, Niacin Amide, Isohexadecane, Isopropyl Isostearate, Stearyl Alcohol, Palmitoyl Pentapeptide-4, Dimethicone, Cetyl Alcohol, Behenyl Alcohol, Polyacrylamide, C13-14 Isoparaffin, Benzyl Alcohol, Ethylparaben, PEG-100 Stearate, Dimethiconol, Methylparaben, Propylparaben, Stearic Acid, Cetearyl Glucoside, Cetearyl Alcohol, Laureth-7, Disodium EDTA, Titanium Dioxide, Iron Oxides. The product is a salmon colour but blends out so there is no colour detectable. There is no scent and it is very emollient and moisturizing. I used the product for two weeks in the photo below. I am not wearing anything but Olay's Ultimate Eye Cream in the before and after photo, no makeup or anything as I wanted the effects that I experience to be clear. 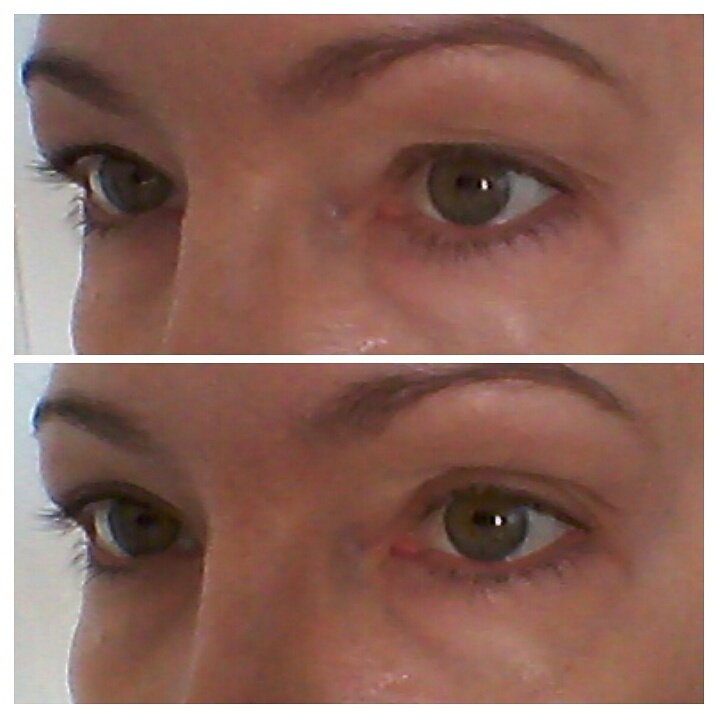 As you can see, the product helped a lot with the hooding on my eyes but not so much with the under eye bags/puffs. I also noticed a significant reduction in the depth of my crows feet (which only appear when I smile). I'd like to see the long-term effects as the lift to my upper eye hooding seems to be a temporary effect for now. I am very happy with the effects and how moisturizing this product is. You only need the tiniest amount for each eye so the 13ml tub will last for a long time. Olay has a great range of eye products to choose from depending on your concerns, so there is something for everyone. I would also love to try the Eye Lifting Serum! Olay® Eyes Ultimate Eye Cream is a 3-in-1 treatment that instantly evens and brightens skin, correcting the look of wrinkles and reducing puffy eye bags, giving you eyes that glow. Olay® Eyes Illuminating Eye Cream reduces tired-looking eyes and dark circles illuminating a brightened, luminous glow. Olay® Eyes De-Puffing Eye Roller de-puffs tired-looking and swollen eyes with a gentle massage roller to reflect tight, awakened eyes. Olay® Eyes Pro-Retinol Eye Treatment decreases deep-set wrinkles around the eyes, to exfoliate, renew and help unfold wrinkles, making them shorter and less deep. It’s great for crows’s feet, the forehead and other deep-set wrinkles. Olay® Eyes Lifting Serum treats sagging skin on eyelids and around the eyes, reflecting a firmer, lifted, younger eye look. You can get more information on products by visiting Olay's website, linked HERE. I received this product free for review through BzzAgent. Wow, Olay have quite a few different eye creams on the market! It really did improve the upper eyelid area. Looks good!